America, The Shining Light on the Hill? I usually drive to work along the Hudson River. It’s a nice drive. Beautiful old buildings to my left and the Hudson on the right. But today I took the bus through the city. In northern Manhattan there was a man, an African American man, dressed in a manner that clearly identified him as a Muslim, trying to cross the street after the bus passed. I reacted. “What a brave man to announce his religious affiliation in this manner.” I was horrified. My immediate reaction was to fear for his safety because people would know his religion. I didn’t have time to consider, “Have we really come to this?” before the bus drove by the mural reproduced above. (Photographed with an iPhone.) 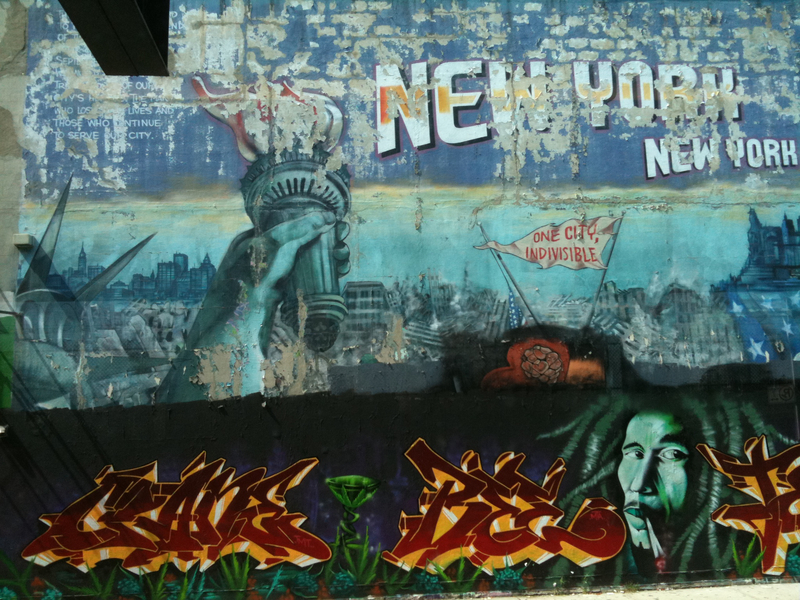 It appears to have been painted around the time of 9/11 or shortly thereafter. (The bottom third is certainly more recent.) It speaks of unity. The unity of New Yorkers. The unity of Americans. Of all Americans. America is in bad shape economically. We have suffered through years of wasteful war. But we have come through hard times before. Let’s hope we can do so this time without condemning the innocent.